Tomer's Take for the Best Skiing This Weekend: Ski Whistler/Blackcomb on Thanksgiving, Aspen/Snowmass on Black Friday, Alta, Snowbird, Jackson Hole or Vail on Saturday, and Loveland, A-Basin or Steamboat on Sunday. The biggest thing I'm seeing from Thanksgiving into the weekend is a very active jet stream that now favors areas devoid of snow just a week ago, including California and Utah. The coldest air of the season takes over the Northeast with some lake effect snow and one to two storm systems. Overall, the pattern is a break from what has looked a lot like El Nino Modoki. Cold. Lake effect snow. Then one to two storm systems with the first arriving Saturday night into Sunday and the second arriving on Monday. The rain/snow line with the first storm looks tricky. Colder with the second storm system. Two storm systems are lined up. The first is minor and the second is major. The first storm system arrives Thanksgiving into Black Friday. Wind speeds build significantly as the jet stream barrels in. The second storm system delivers heavy snow accumulation between Friday night (Utah) and Saturday (Colorado). 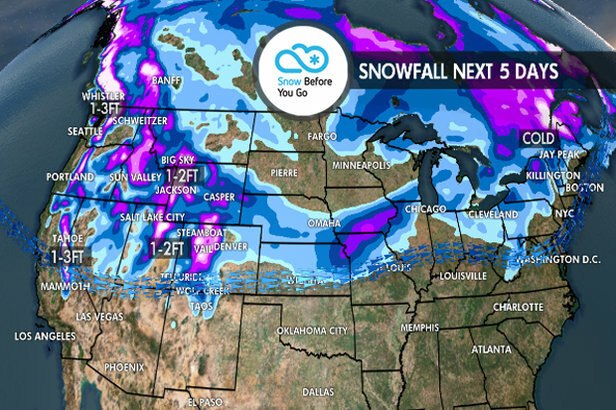 Less overall snow will fall in New Mexico. Mountaintop wind gusts may push 100 mph in Colorado on Saturday. 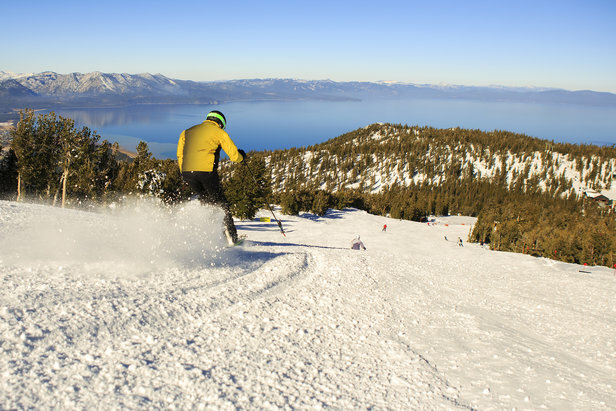 Sunday appears to be the powder skiing day as skies clear. Grand totals by Sunday morning will range from 1-2 feet, including Alta, Snowbird, Vail, Crested Butte, Snowmass, Steamboat, Loveland and Arapahoe Basin. 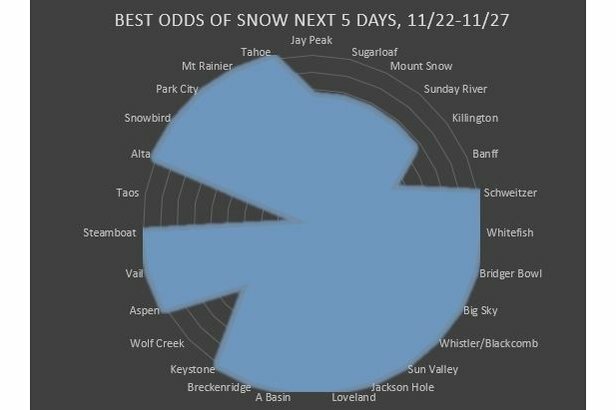 Ski Resorts with the best chances for snow through this weekend, 11.22.2018. Two storm systems push two to three different shots of snow into all three states. The first shot of snow arrives on Thursday with light accumulations. The second is light to moderate on Friday. The third is heavier on Saturday. Grand totals will range from 1-2 feet by Sunday morning at many ski areas, including Jackson Hole, Grand Targhee, Sun Valley and Big Sky. Schweitzer, Discovery, Whitefish and Bridger Bowl will also do well. It's going to be an active stretch with rain/snow between Wednesday and Saturday with possibly another quick hitter on Sunday. Snow accumulations on the high peaks and volcanoes will range from 1-3 feet. Snowy stretch ahead at mid and upper mountain with 1-3 feet of total accumulation by Sunday. There are two storm systems moving into the Pacific Northwest through the weekend, but with the southern track of the jet stream, I think both storms only brush Banff with light to moderate snow accumulation. Heavier accumulations may stay on the western side of the range and closer to the coastal range. Finally. Two storm systems will push heavy rain and snow into California starting Wednesday afternoon and ending on Saturday. The rain/snow line becomes critical and may start at Pass level or higher. Total rainfall may range from 2-6 inches with valley flooding. Higher up, I do expect 1-3 feet of total snow by Saturday (above 8,000 feet).